Last Sunday we went to Durham (North Carolina) for a presentation to the Durham Democratic Women by Deborah Ross who is running for the U.S. Senate against the Republican incumbent Richard Burr. The talk was a combination of vote for me, get your friends to vote for me and please help me to fund the campaign. Deborah is a powerful speaker, totally on the ball and so dynamic that she makes my high level political friends in England look as though they have “slow blood”. The good news is that she is within two points of the incumbent Senator Burr (according to the latest poll released last week by the conservative leaning Civitas Institute). 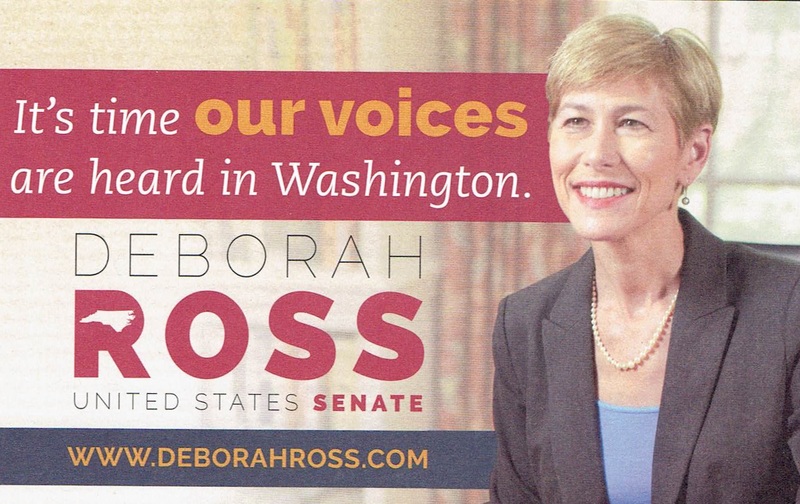 The now toss-up race follows Ross’ strong first quarter fundraising where she out-raised Senator Burr. The neck-and-neck poll also comes as more and more voters have been learning of Senator Burr’s out-of-touch record in Washington where he voted to cut Social Security, wrote legislation to privatize Medicare, supported cuts to Pell grants and voted to give tax breaks to companies that ship jobs overseas. The bad news is that her election pot is nowhere as large as Senator Burr’s. He has been endorsed by the National Rifle Association and the impression is that is he well supported by his political friends. And this is where we get to more bad news. As Donald Trump becomes the Republican presumptive and unelectable presidential candidate, – so the Republican funding may not go him but to the lesser elected posts like Richard Burr’s and sundry others whose opponents do not have access to funding from the likes of the Koch Brothers. It will be interesting to see where the contests go – so I can only say watch this space. Meanwhile Tuesday’s Raleigh News and Observer notes that we have had an unfilled Federal judiciary post since 2006 and Senator Burr is refusing to approve the nomination of a qualified person. To quote the News & Observer: “in opposing the nomination, Burr said he won’t submit the “blue slip” that’s needed from the home state’s senator to get a judicial nomination moving. Burr’s opposition is unfair to the nominee and unfair to the system which is running short of federal judges.